You know who I am, but do you really know me? 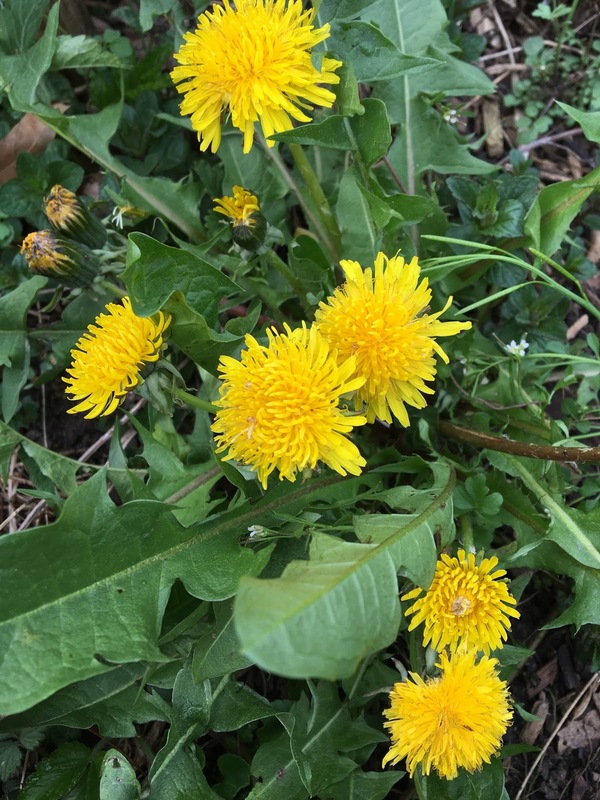 I am Dandelion, or Taraxacum officinale. Chemical companies reap profits hand over fist by telling you I am an enemy. Even some of the many names for me elicit giggles from their literal meanings. In Deitsch, I am known by several names: Bettseecher ("bed-pisser"), Pissebett ("piss-the-bed"), and the less onerous Biddre-Selaat ("bitters-salad"), Hinkelselaat ("chicken salad"), and Kiehlblumm ("cool flower"). These names belie my nature. Folklore reveals my noble roots. I am the child of Sunna and Muun. The rays of my mother and the reflected beams from my father tell me where to grow. When I am young, I look like my mother, beaming in radiant yellow. When I age, I take on my father's features, appearing as a grayish globe until I set my seeds to the wind. My spirit is said to aid in calming anxiety and in attracting the attention of land spirits. I am of the tribe called Cichorieae, where my extended family includes Chicory/Succory (Deitsch: Andivdi or Ungaarischer Selaat; tax: Chicorium intybus), with whom I share many herbal properties. In fact, Deitsch herbalist Christopher Sauer (310-313) lists me under the header of Succory in his botanical because our properties were considered to be so similar. I am cool and dry in my nature, and Sauer cites these aspects as being helpful in remedying inflammation of the liver, a function for which my root is best known. As I appear in the spring, it is tradition in many parts of the Deitscherei to gather my leaves and flowers for a traditional salad that is prepared with a hot bacon dressing. Christians consume this salad on Griener Dunnerschdaag (Maundy Thursday) or Easter, and Urglaawer at Oschdre... and many Deitsch eat it throughout the season. This salad is a Spring Tonic, helping to remove toxins by stimulating the gallbladder, the liver, and the kidneys. Speaking of the kidneys, my most common Deitsch name does reveal the fact that I am a diuretic, which can help to reduce blood pressure by reducing the volume of fluid within the body. Among my other uses are treatments for constipation, gallstones (Galleschtee), acne, psoriasis (Schuppeflocke), eczema, edema/swollen ankles, insomnia, and other ailments. Wine made from me has long been used as a cure for colds (Folklore Fragments 118). My root has been worn as an amulet to protect against cataracts (Brendle & Unger 124), and tea from my root is said to help one's nerves (Lick & Brendle 73). Collect my leaves, stems, and flowers on Walpurgisnacht (April 30) to block hexes. Hexes may be blocked by carrying me or consuming me. Drying me and keeping me around for a time of need can be a big help! Despite my astonishing array of medicinal and self-maintenance, though, humans continue to treat me like I am harming them with my very presence in their yards. Take some time to get to know me, and you may find I have a lot to offer you! Chevallier, Andrew. Encyclopedia of Herbal Medicine, p. 141 New York: Dorling and Kindersley, 2000. Fogel, Edwin Miller. Beliefs and Superstitions of the Pennsylvania Germans. Millersville, PA: Center for Pennsylvania German Studies, 1995. Folklore Fragments. Keystone Folklore Quarterly 9, 1964. Lick, David E. and Thomas R. Brendle. Plant Names and Plant Lore among he Pennsylvania Germans. Proceedings of the Pennsylvania German Society 33. Norristown, PA, 1922. Weaver, William Woys. Sauer's Herbal Cures: America's First Book of Botanic Healing. New York: Routledge, 2001.